The new ATI Scorpion X2 Grip is designed for comfort and maximum performance. ATI Gunstocks introduced their new Scorpion X2 AR-15 grip at SHOT Show this year. 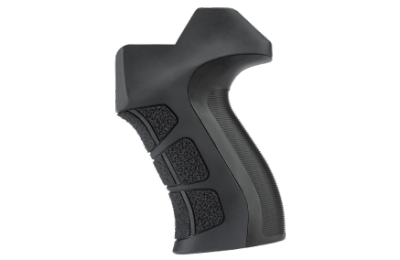 The Scorpion X2 is an ergonomically designed pistol grip option for the AR-15, or Modern Sporting Rifle (MSR). The Scorpion X2 incorporates several design features from various existing grips, and is made from DuPont glass reinforced polymer. We previously reported on the ATI Scorpion X2 grip in our article on the new Mossberg 500 ATI Scorpion 12-gauge shotgun. This new Mossberg shotgun option is completely decked out with ATI Scorpion accessories. We did not get a chance to shoot the Mossberg Scorpion shotgun at SHOT Show, but we did take time to test out the features on the floor, and we were really impressed with all the upgrades. ATI Gunstocks is not associated with American Tactical Imports. ATI Gunstocks entered the design process of the Scorpion X2 AR-15 grip with a scientific process to create a pistol grip with optimal angles and grip distance to the trigger. Using high quality DuPont glass reinforced polymer the Scorpion X2 grip is not only comfortable it is designed to optimize grip angle, placement, and recoil management. The Scorpion X2 AR-15 grip maintains soft, textured grip sections on the front of the grip for finger placement, but removes the built-in finger grooves from the original Scorpion X2 AR-15 grip. The original Scorpion pistol grip had built-in finger grooves. Some shooters appreciate the built-in finger grooves. 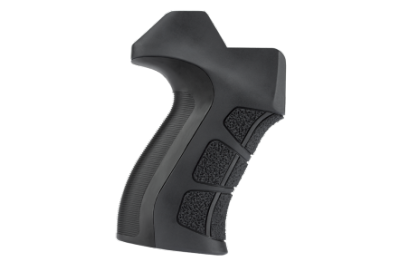 If the shooter’s hand fits the grooves, this feature can be extremely valuable in providing an excellent grip and improved overall control of the AR-15. However, built-in finger grooves limit the hand sizes that will fit those built-in features. For that reason, most shooters prefer a straight grip that allows a much better grip for shooters with a variety of hand sizes. The Scorpion X2 grip uses Mil-Spec locking rings. The lower grip angle helps with close-in rifle presentation and recoil management. 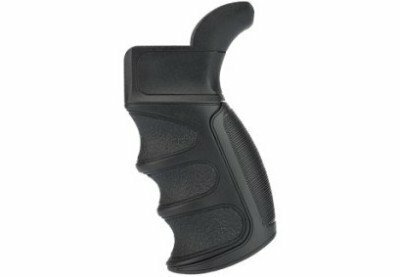 The original AR-15 grip was hard plastic with a steep angle and a single finger groove. The grip was rather small in width, and has garnered complaints with many shooters. For the last 20 years or so, with the enormous gain in popularity of the AR-15, there have been many accessory options to enter the market. New grips like the ATI Gunstocks Scorpion X2 are great improvements that make the AR-15 even more practical and user-friendly. The Scorpion X2 grip in FDE. The ATI AR-15 Scorpion X2 grip is designed to fit with a Mil-Spec locking ring, and will not fit with locking rings that have additional sling loops or QD Mounts. The X2 features a material that absorbs the initial shock wave which is the felt punch of the recoil. The AR-15 Scorpion Pistol Grip increases the shooter’s comfort while reducing the muzzle lift. The high tang, improved curves, and soft grip provide an excellent product designed for shooter comfort and improved performance. The ATI Scorpion X2 grip in Destroyer Gray. There have been a lot of advancements in AR-15 accessories. Some good and some not so good. The ATI Gunstocks Scorpion X2 AR-15 pistol grip is definitely one of the good ones. The scientifically engineered grip angles, and materials provide excellent comfort and recoil management. In addition, the reduced angle and high tang, provide a natural grip for the shooter with outstanding recoil management. The price of the Scorpion X2 pistol grip is very competitive, and the advantages in its design make it a strong contender for law enforcement, professional, and recreational shooters alike. However, the grips higher tang makes using certain single point or QD sling attachments impossible. The shooter will have to decide if their particular sling attachment or an improved grip is a higher priority.